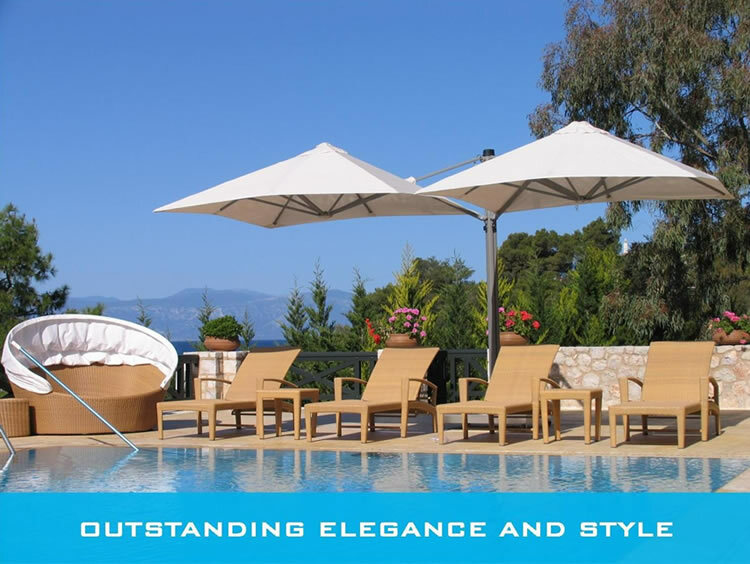 Ozsun’s unparalleled range of pool umbrellas, pool shade systems, outside patio umbrellas, outdoor awnings, wind resistant sun shades and other outside umbrellas represent the finest in design and construction, developed specifically for the harsh Australian sun. 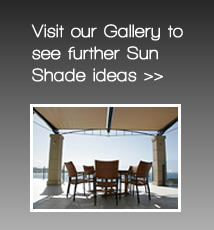 You deserve the best shade for your outdoor spaces. 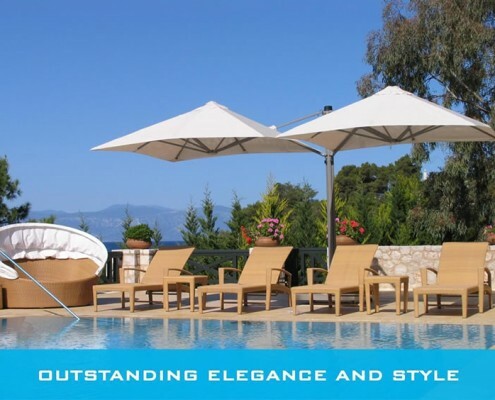 Ozsun’s Designer range includes the award winning SU7 single mast and SU6 multi mast umbrellas. 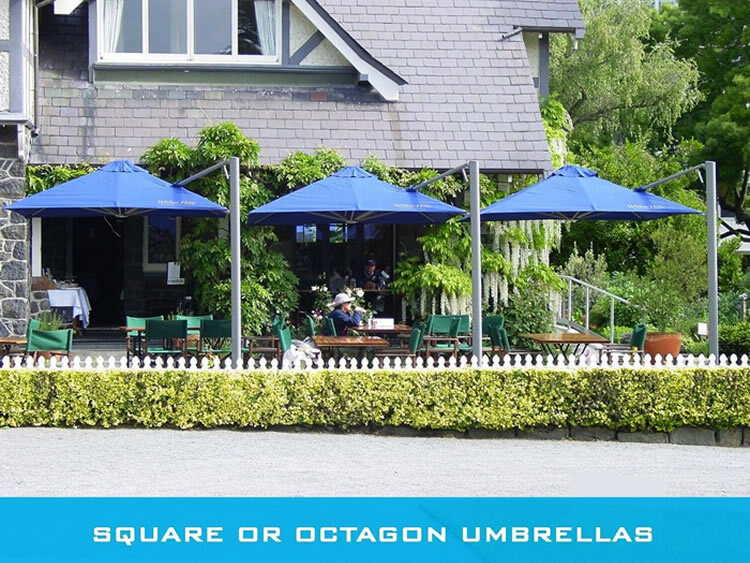 Available in three different sizes, a wide selection of colours and the choice of an octagon or square umbrella, this rotating cantilever umbrella represents elegance and quality from every angle. 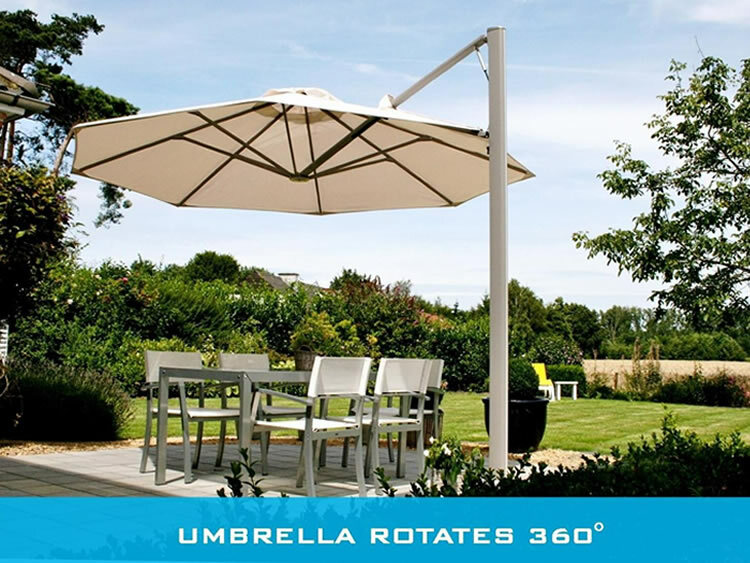 With the ability to rotate 360° and modern gas-strut assisted deployment, this premium umbrella can be raised and lowered in ‘one easy movement’. 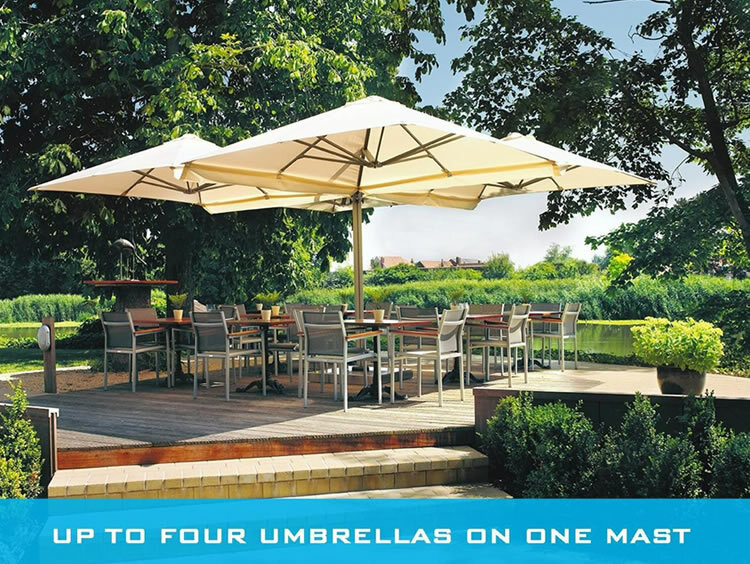 With the ability to mount up to 4 umbrellas on one mast this brilliant umbrella is a world leader and in a class of its own. 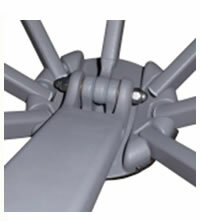 Thanks to modern gas-strut technology each umbrella can be opened and closed individually with ease. No ropes & pulleys…. No winding crank systems…. just one easy sliding movement. 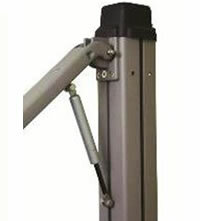 Heavy duty reinforced Aluminium mast mounts up to four umbrellas at one time. This patented ‘One-movement’ Sliding system enables the SU6 Umbrella to be opened and closed easily in one single movement. 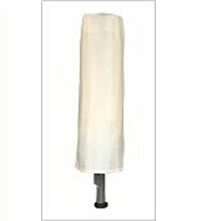 Compensates the weight of the umbrella during the raising and lowering process making the umbrella ultra light to handle. 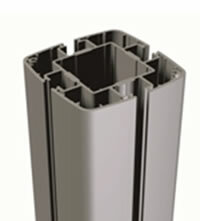 For locations close to the sea we recommend a stainless steel Gas Strut option. The tough aluminium hub is the heart of our SU6/SU7 umbrellas. Fully design engineered, complete with neoprene washers, brass bushes and S/S hardware, the construction of this hub is just an example of the attention given to every design detail to ensure the durability and quality of the SU6/SU7 umbrella is unsurpassed. 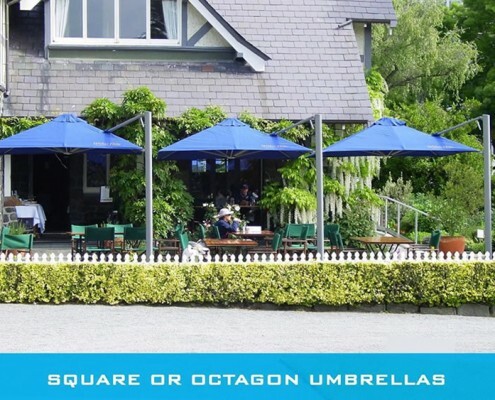 One of the premium features of the SU6 Cantilever Umbrella is its Heavy duty Multi-mount mast which enables it to have up to 4 individual umbrellas mounted on the same mast. 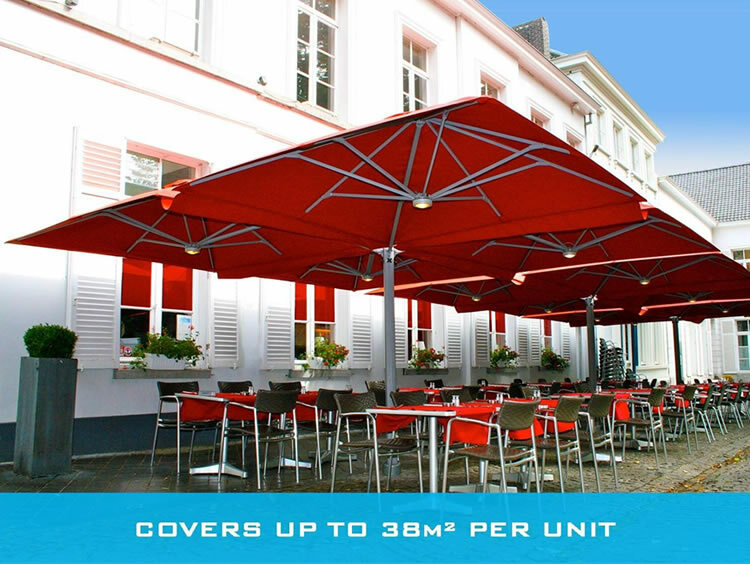 Each umbrella is seperately operatable allowing great flexibility regarding exactly what size area you need to provide shade for. This also means that 1-2 Umbrellas can be purchased for a start with more added over time or you can purchase all four umbrellas at once. How do they perform in the wind? For locations exposed to excessively high winds check out our NEW SU8 High-Wind performance umbrella. The SU8 has been wind tunnel tested up to 90 km/h and we have the video to prove it…. 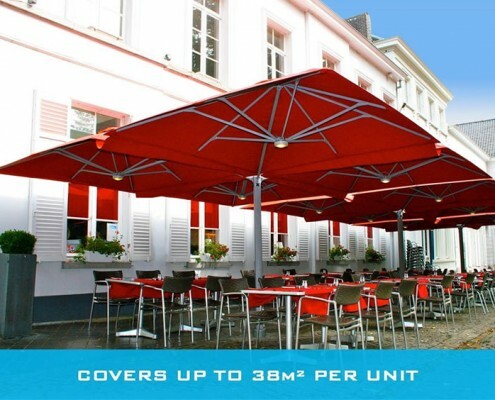 The SU6 Umbrella Canopy is manufactured from Premium DICKSON Acrylic fabric. 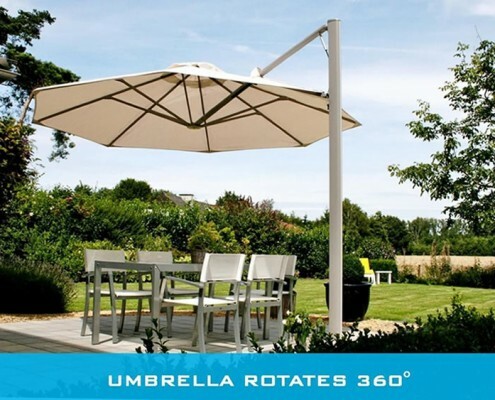 The SU6 Umbrella is available in ten popular colours. Today everyone is preoccupied by the need to protect themselves from the sun’s UV rays. This protection also contributes to our comfort and promotes good health. All standard colours filter almost 100% of the UV rays except the colours Arctic White and White Sand which filter 95% of the UV rays. 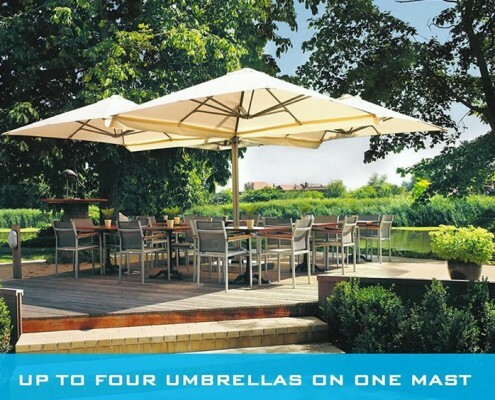 The Protection cover protects the umbrella form the weather when not in use. 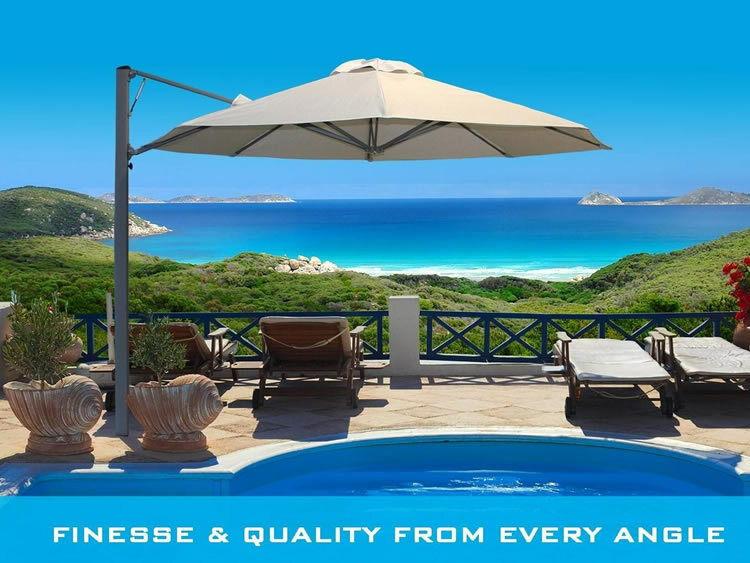 It is provided with the umbrella at no extra charge and will assist in ensuring that the umbrella is always looking clean and smart. 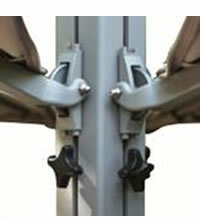 Raingutters - to connect adjoining square Umbrellas in view of increasing the weatherproof area. These can be easily attached and/or removed at any time. 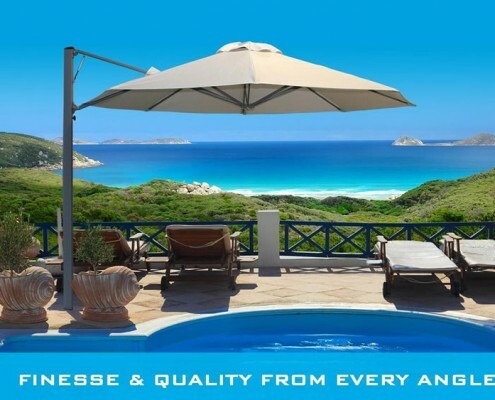 Every Ozsun Outdoor Umbrella comes with an extensive warranty for customer assurance purposes.